We have a small wooded area of around 300 trees which we refer to as The Forest. Within The Forest we have some fantastic spring flowers now emerging from their winter sleep. After the snowdrops it’s the daffodils, which come in many shapes, sizes and colours alongside primulas and primroses. Soon the forest floor will be covered in countless bluebells, which I have to say are my favourites. Probably because, as a young boy, I spent much of my time climbing trees in an area we called Bluebell Wood. In our Forest, a challenge which we experienced last year was as the spring flowers flourished, we slowly but surely watched them gradually disappear under a sea of nettles, which I noticed this week, are already sprouting up through the earth. We have thought about spraying the whole area but are keen to not upset things too much or eradicate the flowers in the process of trying to rid ourselves of the pesky nettles. We have thought about embracing the nettles by using them practically in both food and drink recipes, but we haven’t yet taken that plunge! With dozens of Rooks looking down from above and with help from friends we have cleared a footpath through brambles and undergrowth so even if nothing else is achieved in there this year, I am determined that we will be keeping that walkway clear of nettles so the flowers can be appreciated to the full, no matter what! Another of our challenges was once again down to yours truly not making one of his best decisions. Not long after moving in, we noticed that one of our fields was in standing water. 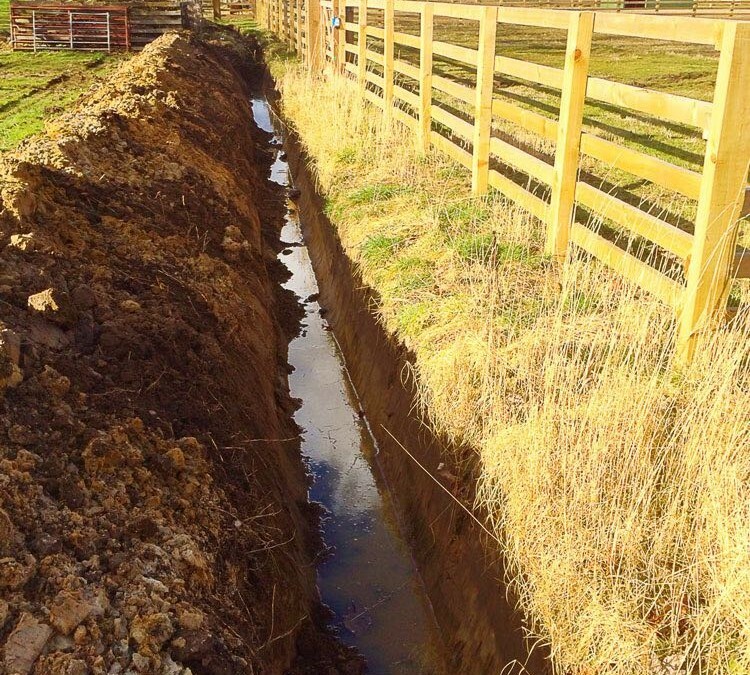 So, last week whilst we had a man and his digger on site, I had him deepen and lengthen one of our existing ditches, which runs alongside this field to help any excess water drain away. Well, in my wisdom I hadn’t considered that this ditch would run behind our compost heap. The down side of extending the ditch was that around 20 feet couldn’t be reached with the digger and so I was left with the little chore of having to dig it out by hand. I decided to tackle it over several days rather than aiming to complete it in record time and do my back in, in the process. Thankfully it’s now all sorted, my back is still in good nick and we’re ready for those April showers should they arrive over the coming weeks – but let’s say I won’t be entering any ditch digging competitions any time soon! To end this week’s warbling I wanted to mention the hawk fest I witnessed this week. In a matter of minutes, as I trundled down the lane home, I firstly saw not one but two Kestrels, and since reading Kes all those years ago in school I have had a soft spot for them. But before I could appreciate them I noticed a Red Kite right over my head, I stopped dead in the middle of the road! I then watched it as it flew off across the fields towards the rising Wolds beyond. I proceeded on my way but was immediately greeted by a Sparrowhawk which flew out of the hedgerow at great speed and proceeded to fly in front of my Landrover, around six inches above the straight road for all of six hundred metres and he turned left as I went right. Wow! Not one but four stunning birds of prey in one place at one time. We are so lucky having such wildlife around us.